'The Mummy Returns' is perhaps the ideal Hollywood sequel. It reunites the same filmmakers with the cast of the original 'Mummy,' adds a couple new faces, puts them all in a plot that effectively replicates the first installment but with a few fresh twists, and ratchets up the action and effects tenfold. Maybe that makes it more of a remake than a sequel, but it's a shrewd move, because the secret to creating a long-lasting movie franchise is not so much continuing the story, but instead giving the audience more of the same... only different. 'The Mummy Returns' does just that in spades, and I found it even more entertaining than the original. Typical of most desperate to please sequels, the plot of 'The Mummy Returns' is a bit overpumped. 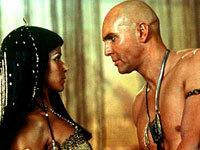 The tale begins with a prologue about the Scorpion King (The Rock) being awakened by the mummy-with-a-funny-name, the high priest Imhotep (Arnold Vosloo) and his bride-to-be (firecracker Patricia Velasquez). After this setup-for-the-spin-off is over with, the real fun can begin, with the return of all our beleaguered heroes from the first film. Timid adventurer Richard O'Connell (Brendan Fraser) and Evelyn Carnahan (Rachel Weisz) are now married with child (Freddie Boath), but still like to spend their time chasing down ancient artifacts and other fun family diversions. But when the remains of the Mummy are sent to a museum in London, a series of events will once again bring the Carnahans face-to-face with their old adversary. Also along for the ride is Evelyn's brother Jonathan (John Hannah, always great comic relief), plus Oder Fehr as Ardeth Bay, a vengeful warrior with his own agenda. This mismatched crew must once again banish the Mummy -- this time, along the way they will battle legions of resurrected undead, survive multiple high-speed chases, pilot a giant hot-air balloon and even defeat a band of little CGI pygmy mummies. Indiana Jones, you had it easy. 'The Mummy Returns' is a lot of fun, although that doesn't necessarily make it a great movie. It is pretty derivative of the first film, which is amusing, since 'The Mummy' itself was a rip off of the Indy Jones movies and every cheesy Saturday afternoon serial ever made. Yet if 'Returns' is nothing new, it does impressively refine everything that worked in the original film. 'The Mummy Returns' moves at a faster clip, is less dour and dark, and each of the cast members is given his or her chance to shine, so that no matter who your favorite character is, there is someone to root for. And returning director Stephen Sommers deserves points for investing every frame of 'Returns' with genuine enthusiasm. Say what you want about the film, but he definitely isn't just cashing a paycheck -- he really seems to care about his schlock. Some aspects of 'The Mummy Returns' don't hold up. I was shocked to see how dated the film's digital effects look only a few years after its release. I've never been a big fan of CGI anyway, but there are some pretty bad shots in this one, particularly the lousy rear-projection work and the way over-the-top climax. 'Returns' also nearly makes the mistake of forgetting that its main characters are Fraser and Weisz, not the special effects and subplots. They are such likable performers that they can easily carry a movie on their own, and hardly needed a kid, the Scorpion King, and all this other stuff horning in on their action. But no matter. 'The Mummy Returns' is all about fun, and the key to enjoying it is just to dive in and leave any high-brow pretensions at the door. If you liked 'Mummy' on the first go-round, you may love the second even more. 'The Mummy Returns' returns to high-def in a 1080p/VC-1 encode that repurposes the same master as the previous HD DVD release, if with a bitrate that often spikes higher. It's such a great transfer, however, that I can't complain much about the regurgitation. It's as close to a reference-caliber disc as any catalog title I've seen. 'The Mummy Returns' was shot on film but post-produced almost entirely in the digital realm. That makes for a very clean source that looks both film-like and unnaturally slick. Non-effects shots (of which there are few, I'll admit) have a more natural look, with minimal grain that is never intrusive. Any element with extensive CGI can sometimes look a bit hard -- some of the digital mattes of actors over rear-projected images in particular are quite contrasted -- but overall, the two halves balance nicely. Colors are robust, with the very Indiana Jones-like visuals flush with warm oranges, lush greens and deep blues. Hues remain rock solid, and noise is not a problem, though a touch of oversaturation can plug up fleshtones. Detail also excels, with the many wide daytime exteriors wonderfully life-like. Unfortunately, as with the HD DVD, only shadow delineation suffers, with a steep fall-off into black that leaves dark scenes dim and doomy. Nonetheless, 'The Mummy Returns' delivers great video quality in spades. As with the Blu-ray issue of 'The Mummy' (which Universal is debuting concurrent with the sequel), 'The Mummy Returns' enjoys a first-ever high-res mix, in DTS-HD Lossless Master Audio 5.1 Surround (48kHz/24-bit). It's absolutely excellent -- this is a demo-worthy presentation. Surround use is the star of the show, with lively and engrossing sound design. There are plenty of first-rate sequences that fully envelope the soundfield -- the opening Scorpion King prologue, the first attack of the mummy creatures in London, and the extended climax (that seems to go on for half the film) are favorites. Discrete effects are directed with pinpoint accuracy, and movement between channels feels absolutely natural. Just the sheer heft of the rear soundstage is a treat. Dynamic range rocks, too, with very deep low bass that delivers great rumble to the subwoofer. The upper range is clean and powerful, and dialogue balance excellent. The mix has great clarity and transparency, and cranked up to a high volume can really be a stunner. Universal has clearly improved upon the previous HD DVD release, and it's great to see the studio embracing high-res audio on Blu-ray right out of the starting gate. Audio Commentary - Sadly, I found this the only real highlight of the supplements. The track features director Stephen Sommers and co-producer/editor Bob Ducsay, while they discuss fairly standard stuff for a commentary at least they are enthusiastic (if pretentious) about the film. Sure, both 'Mummy' movies were mega-hits, so I suppose it was easy for them to forget that none of their derivative movies were ever even remotely memorable five minutes after leaving the theater. Still, Sommers and Ducsay a relate a good share of on-set shenanigans, from surmounting the production challenges and working with all the effects to the chemistry between Brendan Fraser and future Oscar-winner Rachel Weisz. And like so many commentaries for blockbuster movies these days, all of the attention is on the effects, not the story. Still, a good listen overall. Featurette: "Spotlight on Location" (SD, 20 minutes) - "Spotlight On Location" is just what it sounds like -- one of those extended commercials that play on HBO. All of the movie's main participants contribute congratulatory on-set interviews, including Sommers and Ducsay, plus special effects artist John Berton, and actors Brendan Fraser, Rachel Weisz, Oder Fehr, Arnold Vosloo, Patricia Velasquez, and, of course, The Rock. While this is a slick-enough promo, the relentless back patting grates and there is a severe paucity of behind-the-scenes footage. In short, I learned absolutely nothing about the making of the film. "Visual and Special Effects Formation" Vignettes (SD, 20 minutes) - Better than the EPK are these effects reels. Highlighting four sequences ("Imhotep Returns," "Pygmy Mummies Attack," "Anubis Warriors Rising," and "Scorpion King Revealed"), each can be viewed in five different iterations: "Conceptual Stage," "Animation Test," "Plate Photography," "Visual FX Elements," and "Final Feature Sequence." Berton narrates, and each subsection illustrates a phase in creating the sequence -- a bit confusing really, but informative enough if you are interested in this sort of thing. Outtake Reel (SD, 5 minutes) - Provides a few chuckles, but not much more. Music Video (SD) - Long before Chris Daughtry ripped off their act, alt-rockers LIVE contributed a song to 'Mummy Returns,' "Forever May Not Be Long Enough." I like LIVE, though why they agreed to be in one of those classic "embarrassed band jams in front of cheesy movie set with film clips thrown in" videos is beyond me. A long way from the glory days of "Throwing Copper," isn't it? 'The Mummy Returns' is a fun sequel, and for my money, more enjoyable than the first 'Mummy.' 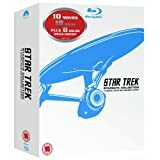 This Blu-ray is very strong, with excellent video on par with the previous HD DVD release, and audio and extras that exceed it. 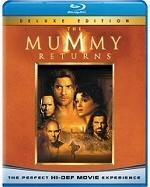 If you've been holding off on picking up 'The Mummy Returns' on high-def, wait no longer -- this is the version to get.